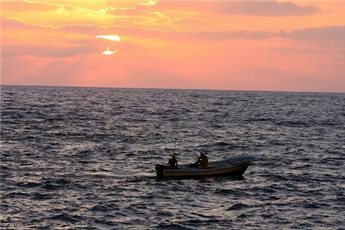 Another Palestinian fisherman has been shot and injured by Israeli forces off the northern Gaza Strip, according to medical officials. Also on Friday, a car belonging to a Jewish settler was hit by "small arms fire" while traveling in the central West Bank, according to Israeli military sources. Ma'an reports that spokesman for the Gaza ministry of health, Ashraf al-Qidra, said that a 22-year-old Palestinian fisherman was injured after Israeli naval forces deployed off of the al-Sudaniya shore in northern Gaza city opened fire at his boat. Ashraf was taken to Kamal Adwan hospital, following the incident, where his injury was reported as "moderate". 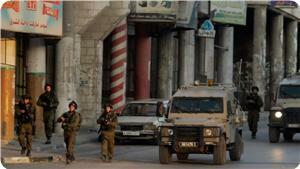 The Israeli military did not immediately return calls in inquiry to the incident. Reports of Israeli forces shooting at Gaza fisherman who stray "too far" from the shore are becoming increasingly frequent. Gaza has been severe blockade imposed by Israel and enforced by Egypt since 2007. Palestinian fishermen are only allowed to go three nautical miles from Gaza's shore, even though the previous agreement settled on 20 nautical miles. Ma'an reports that there are 4,000 fishermen in Gaza and, according to a 2011 report by the International Committee of the Red Cross 90 percent are ipoverished -- an increase of 40 percent from 2008. The economic crisis is a direct result of Israeli disenfranchisement of the fishing industry. In the West Bank, on Friday afternoon, Ma'an reports that a car belonging to a Jewish-Israeli settler was hit by "small arms fire" while traveling in the central West Bank. The shots hit the car while it was traveling near the Jewish-only settlement of Geva Benyamin, near the Palestinian village of al-Ram, the army said in a statement. In occupied East Jerusalem, today, hundreds of Palestinian Muslim worshipers were forced to pray in the streets of Jerusalem's Old City after Israeli authorities again imposed regulations on worshippers trying to enter the Al-Aqsa mosque compound for noon prayers. More than 500,000 Israelis live in settlements built across the West Bank, designated "Jewish-only", in direct defiance of international law which prohibits the transfer of civilians from the occupying population onto occupied territory. Many of the so-called "settlements" have been built directly on lands which have been confiscated from local Palestinian communities, with roads and other facilities being constructed for exclusive Jewish use. A pregnant Palestinian woman on Thursday afternoon suffered from severe suffocation following heavy firing of tear gas canisters by the Israeli occupation forces (IOF) near Al-Madares area in Tekoa east of Bethlehem. According to local sources, violent clashes broke out between Palestinian civilians and Israeli troops, who showered the area with tear gas grenades. Pregnant lady Amina Al-Badan suffered breathing difficulties after having inhaled tear gas and was rushed to a hospital for treatment. The intensity of tear gas attacks caused nearby wheat and barley fields to catch fire. In a related context, violent clashes broke out between dozens of Palestinian unarmed youths and a horde of extremist Jewish settlers on Thursday evening around Burin village, south of Nablus. 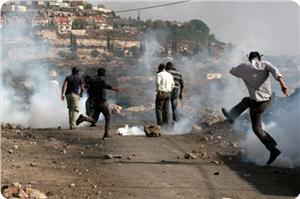 The settlers attacked four Palestinian young men in Mount Sabea with stones. They wounded one of them in his chest and caused damage to a Palestinian-owned car. A number of fanatic Israeli settlers invaded the Ush Ghrab area, east of Beit Sahour, apparently preparing to install a new illegal settlement outpost. The area, a former military base, is subject to frequent attacks by soldiers and settlers. 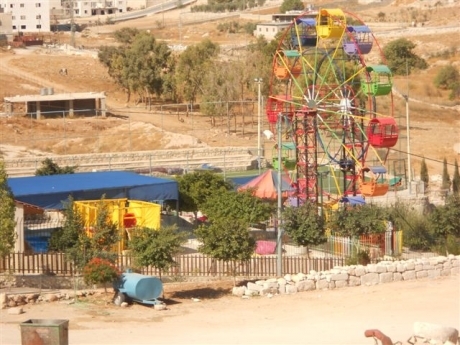 Local sources said a large number of settlers invaded the area, and started preparing for what seems to be yet another “new settlement outpost”, in an attempt to push the Palestinians away, especially since a public recreation park has been set up by the Palestinians. Ush Ghrab area is legally and officially Palestinian property, but the army and fanatic Israeli groups are trying to confiscate it, and prevent the Palestinian from entering it. In April 2006, the Israeli army unilaterally withdrew from their post at Ush Ghrab. Residents in the quiet residential neighborhood rejoiced; but short-lived joy turned to deep concern when Israel imposed a military control order for the entire area. The Beit Sahour Municipality stepped in and successfully had the order lifted. Israel granted permits for the development of a community recreational park; but the application permits for a children’s hospital funded by Cure International had been repeatedly denied and plans for the hospital at Ush Ghrab had to be abandoned. In 2008 Women in Green, an Israeli settler organization, began to arrange activities in the area they call Shdema in preparation for the establishment of a Jewish settlement. The group claims that Beit Sahour municipality is illegally building the community center on part of their “rightful Jewish land”. Knesset members Arieh Eldad and Minister of Foreign Affairs Avigdore Lieberman, who live in settlements supported settler efforts. In spite of Israeli events held at the abandoned military buildings, off limits to Palestinians, then Prime Minister Salam Fayyad inaugurated the Ush Ghrab Park in 2008. In October 2009, park construction materials purchased with a loan from USAID were confiscated by the Israeli military. They were never returned. In January 2010, the park was vandalized: the Star of David, Hebrew writing and “Israel is Jewish” were spray painted over the park walls. Shortly before March 2010, rumors circulated that another Jewish settlement was to be built on the former military site at Ush Ghrab. Local Palestinians feared re-occupation of the land Israel had agreed to turn over to the local municipality. The army’s decision to allow illegal Israeli settlers to install a settlement outpost on city land used as a public park infuriated local residents. An extremist Jewish organization on Thursday disseminated leaflets in the Old City of Jerusalem calling for the demolition of the al-Aqsa Mosque, Palestinian residents said. The residents told Ma’an that as they left their homes in the morning they found thousands of leaflets in Hebrew scattered in all roads and alleys including the alleys leading to al-Aqsa Mosque. 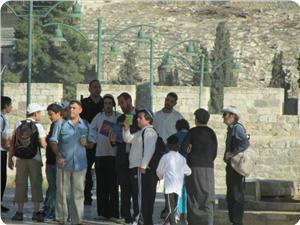 The leaflets were signed by an extremist Israeli organization called “Going back to the (Temple) Mount”. 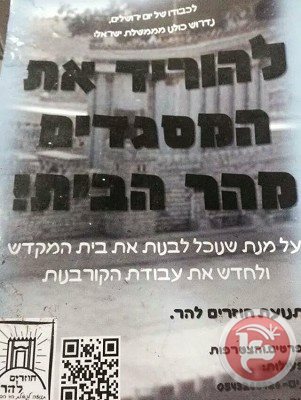 “In respect of the Jerusalem Day, let’s all ask the government of Israel to tear down all mosques on Temple Mount in order to be able to rebuild Beit Hamikdash (the Holy Temple) and renew sacrifice works,” the leaflet reads. Israeli soldiers demolished the Bedouin village of al-Araqib, in the Naqab (Negev), for what amounts to the 69th consecutive time, on Thursday, say witnesses. The previous evening, suspected Jewish vandals slashed the tires of eight Palestinian-owned vehicles in Baqa-Gharbia town, pre-1948 occupied Palestine. The villagers of al-Araqib, near Beer Sheba, have called upon the international community and all relevant human rights organizations to intervene and stop the systematic measures against them, by the Israeli government, WAFA reports. Violations against the Bedouin community are frequent and ongoing. By such attacks, Israeli authorities seek to displace the residents living in the area as prelude to seizing their land for the benefit of settlement expansion. 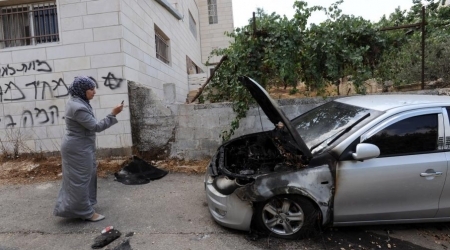 According to local sources, a number of Jewish vandals, most likely belonging to a "Price Tag" gang, punctured the tires of 8 civilian Palestinian-owned cars parked at al-Qasmi college, Baqa-Gharbia town, where they defaced the bodies of the vehicles with sharp tools. After the vandals carried out the attack, Al Ray Reports, they escaped from the area in a Toyota car, according to witnesses. “Price Tag” attacks come from a group of Jewish militant civilians which carries out destructive and intimidating actions directed against Palestinians and their property, Al Ray further reports, including mostly land but also mosques and vehicles in the West Bank, and increasingly in Israel itself. Attacks of this particular nature were included in the US State Department's 2013 Country Reports on Terrorism, published April 30 of this year. Israeli settlers and representatives of Israeli Foreign Ministry stormed on Thursday morning al-Aqsa Mosque from the al-Magharbeh Gate amid tight police protection. 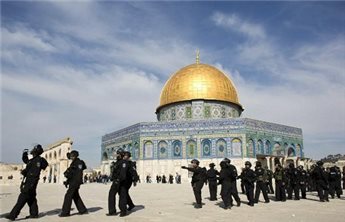 SAFA News Agency quoted media director at the Aqsa Foundation for Endowment and Heritage Mahmoud Abul Atta as saying that 66 Israeli settlers including 40 representatives of Israeli Foreign Ministry stormed al-Aqsa Mosque compound. He said that hundreds of Palestinian students have stationed since early morning in al-Aqsa Mosque and started shouting 'Takbir' protesting the settlers' break-in. Israeli police imposed tight restrictions on the students' access to the mosque, where they checked and scrutinized their identity cards before their entry, Abul Atta added. He pointed out that Israeli occupation authority had planned to facilitate settlers’ entry into al-Aqsa Mosque on Wednesday; however Palestinian worshipers' presence in the mosque had foiled the Israeli schemes and attempts to break into its squares. Jewish settlers performed Talmudic dances at the gates of al-Aqsa Mosque on Wednesday and chanted slogans calling for accelerating the establishment of their alleged Temple on the ruins of the holy mosque. The Foundation media director described these Israeli continued break-ins and violations in al-Aqsa Mosque while blocking entry of Muslims as a serious escalation aimed at paving the way for dividing the mosque temporally and spatially between Muslims and Jews. Abul Atta also pointed to Israeli attacks and Judaization schemes against Jerusalemites and their properties especially during Jewish holidays. Al-Aqsa Mosque was subjected on Wednesday to Israeli break-ins during which Israeli forces used batons and pepper gas against Palestinian worshipers, which led to several injuries among them. Four Palestinian girls, at least one of whom is under the age of criminal culpability, are detained and brought for interrogation — without their parents being present — based on a complaint made by a local settler. Israeli soldiers and police detained four Palestinian girls between the ages of 11 and 15 on suspicion of — eating cherries from trees belonging to the Jewish settlement of Maon in the south Hebron hills on Tuesday. The four were held at the Kiryat Arba police station. The girls, who live in Khirbet Tuba in the south Hebron hills and go to school in a-Twane, are escorted to and from school on a daily basis by Israeli soldiers. The escorts are a response to years of harassment by settlers who attack Palestinian children on their way to and home from school. According to B’Tselem, a settler from Maon told the soldiers who were escorting the Palestinian girls that they ate some cherries from the settlement’s trees. According to the report, the soldiers immediately called the police, who took the girls to the Kiryat Arba police station to be interrogated. Atty. Gaby Lasky, who is representing the minors, spoke with police on the phone and she was told that the 11 year old and another girl, who apparently has learning and speech disabilities, were released once their parents were contacted. The two others were being held for questioning. “I have a murder and manslaughter cases that they haven’t questioned the suspects for over a year, but [these girls] need to be interrogated immediately, and without the presence of their parents,” Lasky said. If the girls were Jewish, it would be illegal for the police to question them without the presence of their parents. Israeli occupation forces (IOF) detained four little girls while returning from school to their homes on Tuesday, one of them is deaf and dumb. Hebrew daily Ha’aretz said on Wednesday that the Palestinian girls were 11 to 15 years old, adding that the incident occurred near Toba village, south of al-Khalil. It said that Jewish settlers filed a complaint against the girls, charging them with “eating cherries from their trees”. The girls denied the charge, the paper said, adding that they were released few hours after their detention in Kiryat Arba police station. A police spokesperson, commenting on the news, said that the girls were investigated after a complaint was filed against them by the settlers. Clashes broke out in Jerusalem's Al-Aqsa Mosque compound early Wednesday between Palestinians and police, as thousands of right-wing Israelis prepared to march through the Old City to mark Jerusalem Day. Locals told Ma'an that Israeli police officers fired stun grenades and rubber-coated bullets at Palestinians, and attacked some with pepper spray. Four Palestinians were injured after being hit by rubber-coated bullets in the head, medics told Ma'an. Dr. Ziad Surour, who works at a clinic inside the Al-Aqsa compound, told Ma'an that police fired at protesters after storming the area. Meanwhile, police escorted Jewish groups through the compound as Muslim worshipers chanted "Allahu Akbar." Israeli police spokesman Micky Rosenfeld tweeted: "Disturbances on Temple Mount. Arabs throw stones at police units at mugrabim gate. Police enter area & disperse rioters. No injuries." But the Israeli news site Ynet reported that a police officer had been lightly injured. It said the Al-Aqsa compound had been closed to visitors as a result of the clashes. Police were heavily deployed in the area as right-wing Israeli Jews prepared to march through the Old City to celebrate what they call the reunification of Jerusalem -- which Palestinians and the international community see as the capture and occupation of the eastern portion of the city during the 1967 war. Earlier, locals said Palestinian men under 50 and all Palestinian women were barred from entering the mosque for dawn prayers. Men over 50 were required to leave their identity cards with police when they entered.